Environmental workers know the importance of indigenous dances in the struggle to save the planet. Therefore, on 5 December 2013, the Gawad Bayani ng Kalikasan spearheaded by the Center for Environmental Concerns (CEC) invited the “beloved Pangalay Dancers to perform at the awards ceremonies” of the Ikatlong Gawad Bayani ng Kalikasan. 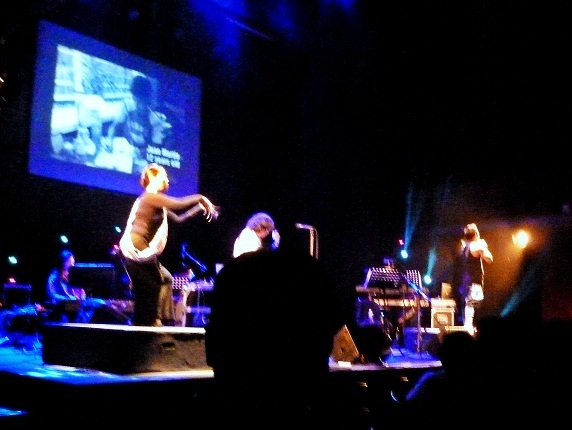 The seven-minute performance by Rama Marcaida and Nannette Matilac used a contemporary composition advocating about issues regarding the environment entitled “Mayad Pag Surip”. 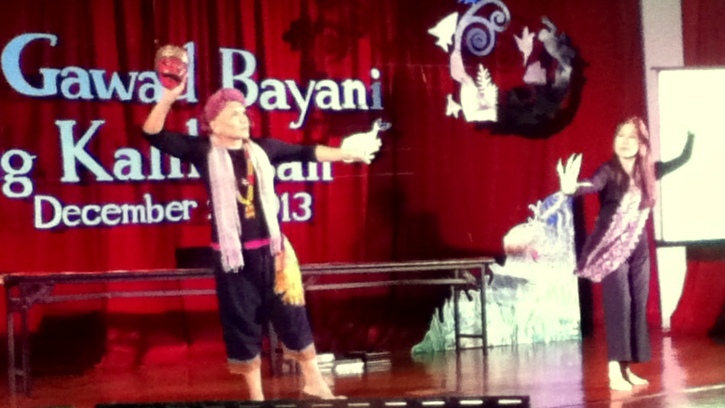 The pangalay choreography fused with some Balinese movements along with a mask (to signify the disturbed environment) was the finale of the awards ceremonies held at the convention hall of the Bureau of Soils and Water Management,Visayas Avenue,Quezon City. 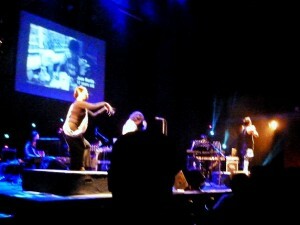 Photos by Erl Elvina. 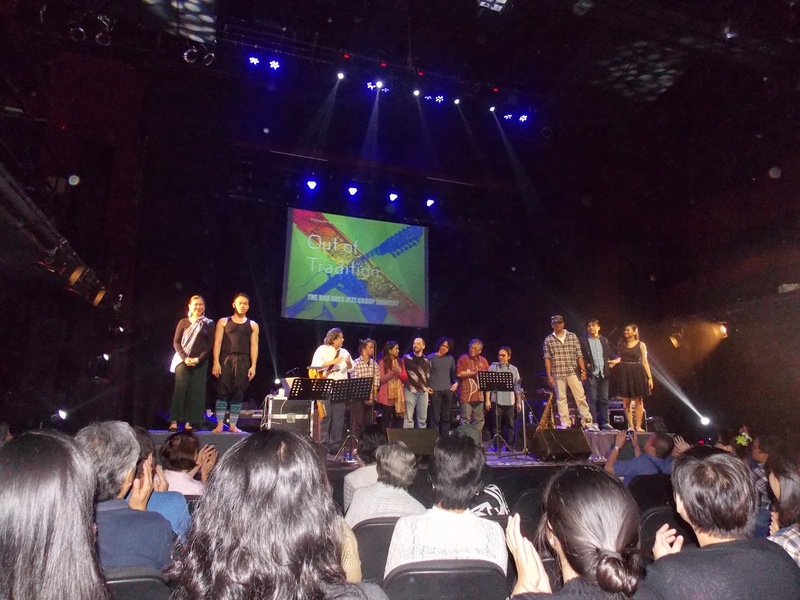 Another opportunity to deliver the message of hope for the ailing environment came on 11 December 2013, during the occasion of the “Out of Tradition” concert by the Bob Aves Jazz Group. 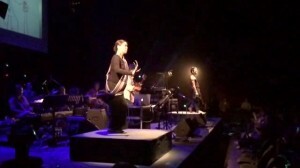 One of the highlights of the concert is a choreography of pangalay in contrast with contemporary dance. 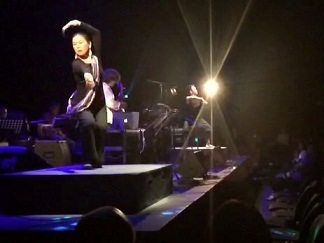 The fusion of contrasts is the essence of the interpretation of the music entitled “Small Steps” composed by Bob Aves. The six-minute composition is re-interpreted by Nannette Matilac with a short film composed of images of children creating art works to express what they deem as “Small Steps by Children” to save the planet. The short film is made possible with the support of LotusBlaze Projects/ DocuCinema Media Collective and the children as co-creators, with their creative visualizations onscreen. The child artists who shared their “small steps” to save the Earth are Hannah Wadi, Careema Wadi, Ayana Matilac, Juan Martin Paz, Tomas Javier Sazon and Abigail Aicie V. Lukban. 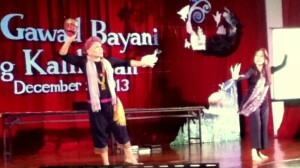 Nannette Matilac and Carlon Matobato at the “Out of Tradition” concert by the Bob Aves Jazz Group, PETA Theater Center. Nannette Matilac (for pangalay) and Carlon Matobato (for contemporary dance) interpret the Bob Aves composition as the dualities in human nature that may result in destruction or renewal of the earth. The concert started around 8 PM to a full-packed audience at the Philippine Educationa Theater Association (PETA) Theater Center. 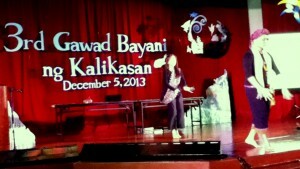 Photos courtesy of Al Avellana. Wow, ngayun ku lang po nakita itong article…. thanks for including my Aicie Abigail Lukban’s artwork…. may link po ba to watch the show?